20 ) What is Little Jimmy’s Italian Ice? Little Jimmy’s Italian Ices are a water-based, fat-free, dairy-free, and cholesterol-free dessert that is available in a variety of flavors. Little Jimmy’s DOES NOT contain high fructose corn syrup, like most other Italian Ices do. Little Jimmy’s Italian Ice is a true Italian ice which never contains any non-dairy creamer, and often is mistaken for ice cream or sherbet. Our Italian ice is produced in the same family owned factory in Iselin, New Jersey since 1957. Our Italian ice is made the old fashioned way – one batch at a time. 19) What flavors are available? Our flavors include: Lemon, Banana, Blueberry, Bubble Gum, Cherry, Chocolate, Coconut, Fruit Punch, Grape, Green Apple, Peach, Mango, Orange, Pina-Colada, Pineapple, Cotton Candy, Strawberry, and Watermelon. We also make a No Sugar Added Lemon Ice made with Splenda and other artificial sweeteners. 18) Can I choose my own flavors? On all orders, you are free to pick whatever flavors you would like, in whatever quantities. Our six most popular flavors in order are Cherry, Blueberry, Lemon, Mango, Pina Colada, and Watermelon. 17) Where is Little Jimmy’s Italian Ice Sold? Little Jimmy’s Italian Ice is made in Iselin New Jersey and is sold factory direct to you. We do have one remote distribution center located in Hialeah Gardens Florida. As a retailer, you can sell Little Jimmy’s Italian Ice at malls, stadiums, amusement parks, festivals, fairs, beaches, flea markets, camps, state parks, swim clubs, golf courses, resort hotels, carnivals, zoos, etc. In fact, anywhere there is a gathering or flow of people, there is an opportunity to sell Little Jimmy’s Italian Ice. Simply put, it’s where the people are. 16) Is there any dairy or non-dairy creamer in Little Jimmy’s Italian Ice? None! All of our flavors are non-dairy water based and blended to a creamy- like consistency. All flavors are fat and cholesterol free. We are a true Italian Ice- We use absolutely no non-dairy creamer in any of our Italian Ices. There is also no High Fructose Corn Syrup which is become a big issue in food and beverages today. 15) How Is Little Jimmy’s Italian Ice packed for shipping? Little Jimmy’s Italian Ices are packed on standard 40 x 48 wood pallets. There is a maximum of 100– 3-gallon containers on a pallet; 60– 5-gallon containers on a pallet. The 3-gallon size is suitable for dipping cabinets inside a store. The 5-gallon size is suitable for pushcarts and mobile truck operations. The pallets are stretch wrapped for shipping strength, ease of unpacking and see-through visibility for quality control. The dimensions of a full pallet of 100- 3-gallon containers are approx. 40 x 50 & 70 high, weighing approx. 2600 lbs. The dimension of a full pallet of 60- 5 gallon containers is approx. 40 x 49 & 69 high, weighing approx. 2400 lbs. 14) How can I sample Little Jimmy’s Italian Ices? A sample package can be sent overnight packed in dry ice. We do not charge for the Italian ice samples, dry ice or the shipping container. However, we charge $90.00 for the overnight UPS shipping (we will credit you back the sample shipping when you place your first order). Just fax us the sample request form, Here is a link to the sample form also. 13) How do I pay for my shipment of Little Jimmy’s Italian Ices? The most convenient and safest way to pay for your order is by credit card. We accept all major cards. We also accept PayPal. All shipments of Italian Ice must be pre-paid. Company checks must clear first. For fastest turnaround we suggest credit cards or PayPal. We also accept wire transfers and certified checks. 12) Where can Little Jimmy’s Italian Ice be delivered to? The best shipping location is to have your Italian Ice shipped directly to a cold storage facility in your area. This will save you time and money. They will accept your shipment from the trucking company when it arrives and place it in their walk in freezer. A recent shipment to Tampa, Florida was delivered to a cold storage facility. The cost of storage for an entire pallet at 0 degrees was $50.00/month! You can keep your product stored there for a monthly fee or you can pay a onetime Cross Dock Fee, they will accept your order and you will have 48 hours to pick it up and bring it to your own location. Just look in your yellow pages for WAREHOUSES-COLD STORAGE or go on-line and Google search for Cold Storage along with your City and State. Then shop for the cold storage facility with the best monthly storage rates and best location to where you live or will be conducting your business. You then can choose to keep one or two 25 cubic chest freezers on premises, and transport the Italian Ice directly to your carts or to your freezers. Remember the product needs to be maintained at 0 degrees Fahrenheit. If you cannot find a frozen warehouse facility in your area give us a call and we’ll assist you in finding one. 11) I am a traveling concessionaire. Can I have product delivered? We can make arrangements to deliver to cold storage warehouses to match your schedule. If you already have frozen storage on your vehicle or concession trailer, Little Jimmy’s Italian Ice can be transported easily from venue to venue. 10) Where I live no one has heard of Italian Ices. How do I know it will sell in my area? Sampling is the answer– A taste of Little Jimmy’s Italian Ice is all it takes. We also have loads of great ideas and suggestions that we pass down to our vendors free (upon request) after one of our Cart Plans has been purchased. 9) Is Little Jimmy’s Italian Ice the same as Snow Cones and Shaved Ice? Not even close! Unlike snow cones and shaved ice (ice with syrup poured over the top), Little Jimmy’s Italian Ice is a delicious and refreshing frozen dessert made with pure cane sugar (no high fructose corn syrup as in virtually all other Italian ices) in a natural water base. Little Jimmy’s Italian Ices are whipped frozen in old-fashioned freeze machines. Simply open the can and scoop out the delicious Little Jimmy’s Italian Ices. Nothing to mix or measure and no machines to clean out. 8) Can I use the logo of “Little Jimmy’s Italian Ice?” Yes, you can use our trademarked name logo, but you must use it in its entirety. 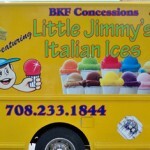 Although, you can use the name, you cannot name your company- Little Jimmy’s Italian Ice. You can however say “YOUR COMPANY NAME” featuring Little Jimmy’s Italian Ice. We have logo artwork available. There are no limitations- This is your own business. You can conduct it any way you wish! If you are looking for help or suggestions along the way we will provide them to you at absolutely no charge. 6) What is the minimum investment for someone to become involved in the Italian Ice business? $32.50 for a five gallon can. You can pick it up from us in Iselin, NJ or shipped to you. The most cost efficient shipping method is to order a full pallet- a pallet of 60 five gallon cans would cost $1950 plus shipping or a three gallon cans cost $23.00; a pallet of 100 cans would be $2300 plus shipping. Smaller quantities can be shipped. 4) Does Little Jimmy’s Italian Ice have any signs or POS material? Yes, we supply free of charge 6 x 6 inch square flavor POS signs. We also have available colorful, eye-catching umbrellas, A-Frame signs, pleated 3 ounce & 5 ounce paper cups, logo printed 7 ounce plastic cups, and plastic baseball helmets of all the Major League teams. 3) What does my Board of Health need to know about Little Jimmy’s Italian Ice? Little Jimmy’s Italian Ice contains no dairy or non-dairy creamer (which can spoil). They are served frozen, whereby it’s nearly impossible for bacteria to build. 2) I would like to purchase one of your cart plans, but I do not understand how the Italian ice product remains frozen in the cart with no motor, no dry ice or block ice? The Italian Ice maintains its temperature in the pushcart from the cold released by the other frozen containers that are in the cart. There is no need for the pushcart to be motorized in order to keep the product frozen. Little Jimmy’s Italian Ice is made for our pushcarts and the pushcarts are made for our Italian Ice- a true Italian ice symbiotic relationship! Dry ice will make the Italian ice too hard to scoop, and frozen ice cubes or block ice will actually melt the Italian ice since water freezes at 32 degrees Fahrenheit, which is higher than the freezing temperature of the Italian ice at 0 degrees Fahrenheit. The ideal serving temperature for Italian Ice is between 15 and 18 degrees ABOVE zero. 1) What are the most important things to do before I receive my first delivery of Italian Ice? Purchase Freezers- Have them plugged in and ready to go before you order arrives. Choose a Cold Storage Facility near Your Home. If you do not have room for chest freezers at your business or location where you plan on conducting your Italian ice operation from, it may be more cost effective to have the Italian ice shipped directly to a cold storage warehouse in your area. Health Department- Find out from your local municipality if there are any permits or licenses you will need in order to start selling Little Jimmy’s Italian Ices. If you run into any problems or roadblocks along the way, call us and we can help you solve them. Location, Location, Location- Italian ices, like all products, sell in places where there are people walking by. That’s the great thing about a pushcart; you can move it almost anywhere. Although this covers most popular questions, please call 732-283-0705 or email me with any additional questions that you may have.